When it comes to wine, there’s no such thing as too many vintages to try for the wine lover in your life. 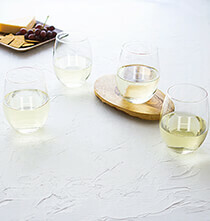 Whether they have a small collection or devote a whole area of their home to storing bottles of wine, we can help you find a special gift that any wine lover can appreciate. 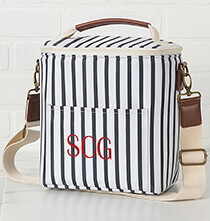 Better still, you can personalize many of these items with a monogrammed initial, date, name or meaningful phrase. Wine is often served from the bottle, but it’s just as aromatic and flavorful when served from a decanter. 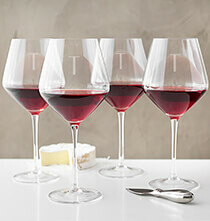 You can give your favorite wine lover this alternative serving option by choosing one of our elegant glass decanters. These are no ordinary decanters. 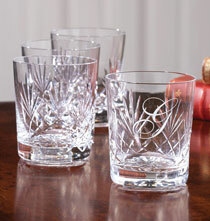 They’re crafted of quality clear glass or crystal and come with matching stoppers. 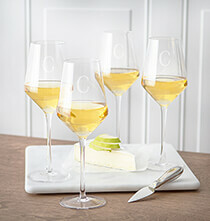 You can also break away from the classic wine glass tradition by choosing a beautiful crystal glass set that can be used for drinking wine and other assorted beverages. Many wine lovers follow the “Have wine will travel” rule of thumb, and we have a fine selection of wine bags that help them tote their wine from place to place. 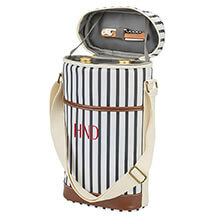 We provide several design options, so you can pair the wine bag with specific occasions. Choices include holiday, special date, married couple and all-occasion. 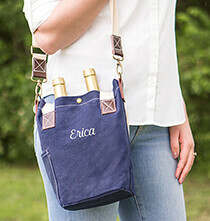 Our wine bags are made of durable linen, feature printing on the front and hold one standard size bottle of wine. 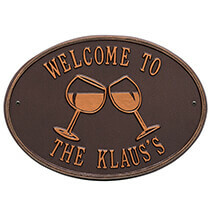 Wine accessories are always a thoughtful gift for those who regularly enjoy wine with or without meals. 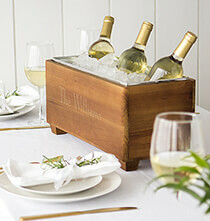 Our elegant wine accessory set includes everything a wine lover needs to open, serve and preserve a bottle of vino. And, it comes in a wood storage box you can personalize with engraved text. 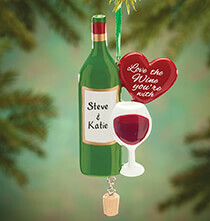 Another popular wine gift item is our wine bottle stopper, which features a tasteful contemporary design. Additionally, if you’re choosing one of our exquisite decanters, add a whimsical decanter label just for fun.